Lozi offers a range of bespoke kitchen furniture solutions. From one of a kind tables and seating to unique items made specifically for you, we have the solution to your kitchen needs. Discover a selection of our previous projects below or get in touch if you already have an idea you would like to bring to life. Pricing is set on a project by project basis so please get in touch at info@lozidesigns.com to discuss a quote. You can also see more of our one of a kind furniture pieces in our Bespoke Furniture section. 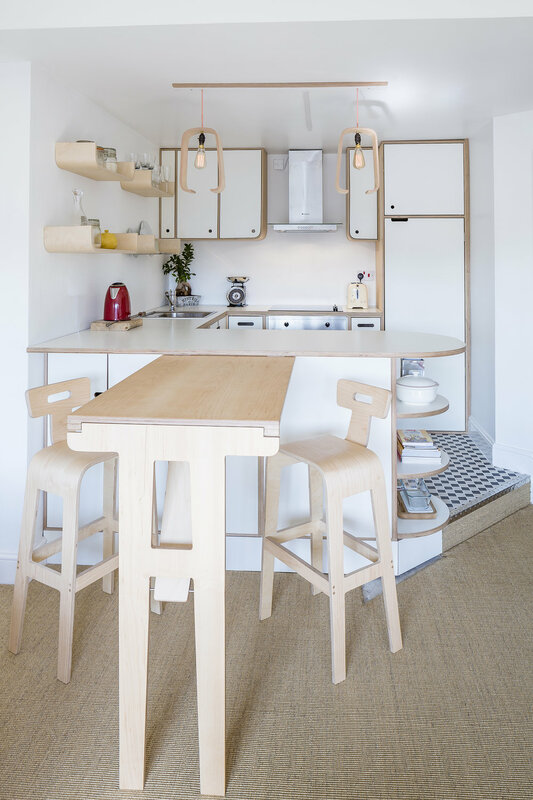 Cass's beautiful plywood and solid oak table was made specifically for her kitchen. The extra long Sea Table made to match the kitchen at Valetta Road. Cass, interviewed for the Lozi journal. "I was impressed with how Lozi's designs were practical but also worked seamlessly in the space so as to contribute to the feeling of airiness and light. Everything is designed to work with the space, not just to be a piece on its own for the sake of its own aesthetic. " The central item of stand alone furniture in any kitchen and used for nearly anything, from dining to a temporary desk, kids play station to extra space for preparing food, this table needs to be a versatile and practical piece. No one wants to be continuously bumping into it or to be short on desperately needed surface space. Lozi can create a one of a kind design to suit your space or we can adapt a design from our existing collection to your specifications. Fabienne wanted a folding table so her neat living room wouldn't be too crowded. Sarah and Peter wanted a small folding kitchen table they could have breakfast on but could also fold away during the day so their kitchen wouldn't feel cramped. Sometimes space is just at too much of a premium for a standard kitchen table. 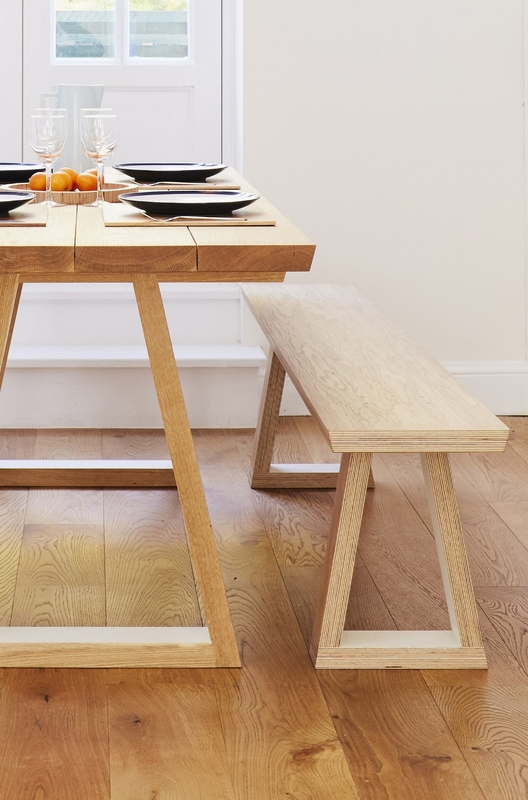 Particularly popular in small urban flats, Lozi has designed several folding tables. Designed to amke the most of a small space and to seamless fold away when not in use, these tables are an ideal way to have the best of both worlds: an ample kitchen or kitchen-living room as well as a great dining space when needed. Cass wanted a long bench to match her one of a kind kitchen table. Fabienne wanted her bar stools to come with an extra back rest to make them more comfortable. Whether one of a kind designs to match your existing furniture or adapted from our standard collection, Lozi can create bespoke seating adapted to your kitchen. Get in touch if you have an idea in mind and we can help make it a reality. Or discover Lozi's furniture pieces that are ideal for any kitchen!